It is hard to believe that three of the four members of the Red Hot Chili Peppers are all in their mid-50s. The band bounced to the stage at Tampa's Amalie Arena on Thursday, April 27th to the tune of "All Around the World" putting many bands half their age to shame. Flea, Anthony Kiedis, Chad Smith, and newest member Josh Klinghoffer were on point, touring in support of their 2016 record The Getaway and making it look easy. 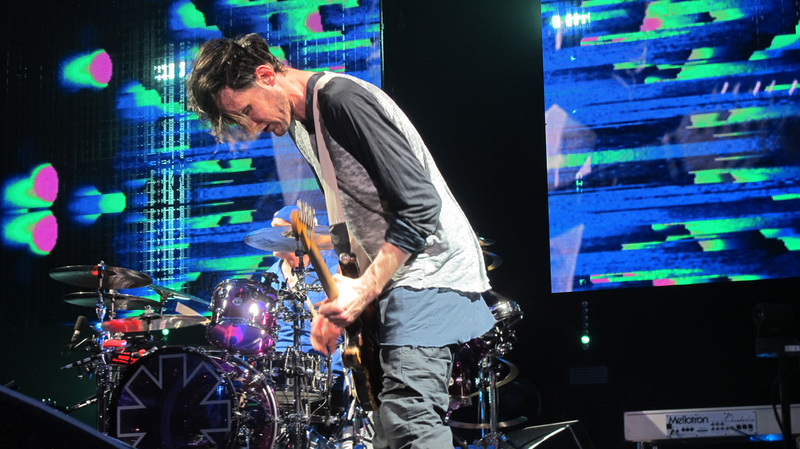 The ever-charismatic Flea dressed in a mix-match of pajama prints, and a vest of old pillow cases twirled his fingers around the neck of his bass in a whirlwind of movement while Klinghoffer and Kiedis danced around him reminiscent of an ancient ritual with the ever steady Smith keeping the funk tight.